Dan Angove, Assistant General Manager, Newtown Artesian Water Company, gives an update on Newtown's drinking water at the August 8, 2018, Board of Supervisors meeting. He answered questions from Supervisor John Mack about Maximum Contamination Levels (MCLs) of PFAS - perfluorinated compounds - in the town's drinking water. 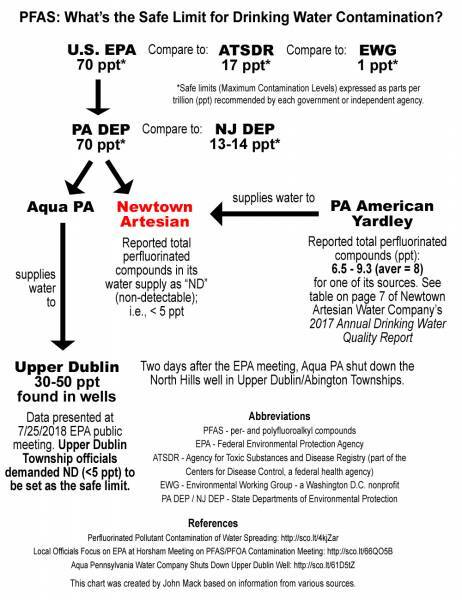 As shown in the chart below, there are several conflicting standards for what is considered the Maximum Contaminant Level (MCL) for these compounds in drinking water and communities are demanding that contaminated wells be shut down even if the water is well below the MCL suggested by the EPA (see Upper Dublin video below the chart). NOTE: This chart was created by John Mack based on information from various sources.